I’ve been meaning to write up a bit of where I’m at with WordPress – which, if you don’t know, is the web-based website making tool that I do most of my work and blogging with. I’ve been using and developing with WordPress for about 10 years now. I know it quite deeply, and I have opinions. And some big changes are coming up. 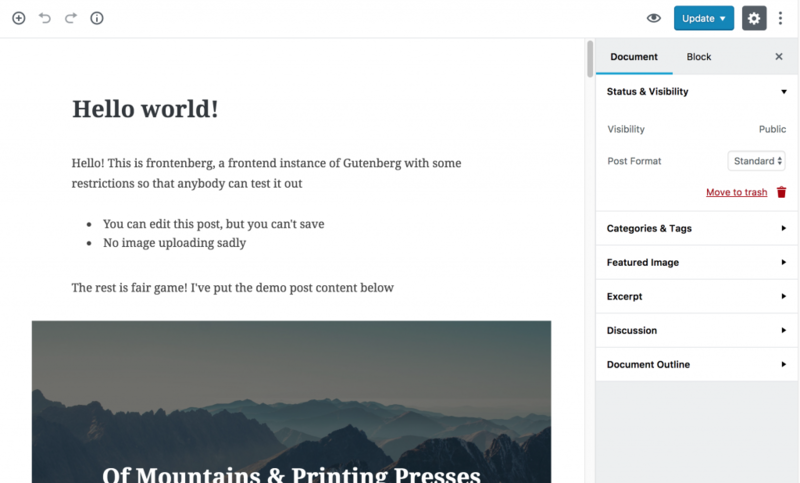 Today, I want to talk about “Gutenberg”, which is the whizzy new “block-based” editor that is coming up in WordPress in the new year. I won’t describe it in detail because that’s been done elsewhere, but if you’ve used SquareSpace or Medium, it’s quite a bit more like that. If you want to actually try it out then someone cleverly made a way for you to do just that. Some of you will be expecting me to dive into a deep discussion about my thoughts as a developer/coder and meta-boxes and stuff like that. But that’s for another post. Today, I was a USER of Gutenberg. I was trying to write a year-in-review post that involved a lot of copying and pasting from Facebook, and I was doing it on an iPad. Now, I know that that’s not necessarily a common use case, but I know that this wouldn’t have been too hard in the normal WordPress editor. But wow was it hard in Gutenberg. Then, after giving up on the iPad, I switched to my laptop to finish it off. What I found there was that, for a post that is mostly just text, images and a couple of embedded videos, Gutenberg actually gets in the way of the writing experience. I’ve been trying hard to be a proponent of Gutenberg. It seems like it’s a good evolution of the WordPress software for the use case of blogging and straight-up content creation. I want to think it’s a good idea. I also know that the team who are making it have been working REALLY hard on it, engaging fantastically well with those who are testing and critiquing it, and that it’s still a work in progress and could still end up being the amazing writing tool that I want it to be. But there was just something about all the extra user-interface popping up everywhere. The way that hovering over any paragraph made all these controls appear (a block for each paragraph creates too many pop-up controls). The way that the new-block interface and the block options are present so much of the time. I just wanted to write – and, I’m sad and sorry to say, Gutenberg got in the way, confused me, and I just wanted to turn it off. If a power user – someone who uses WordPress a lot and has high hopes for Gutenberg and wants to like it – finds it intrusive and complicated, then what will that mean for the every-day blogger? Gutenberg still has work to do to win me over. I hope the team building it can make it right. 2017 in review – Ask Me Anything! Hi Ross, I too have similar concerns to yourself for exactly the reasons you have mentioned. Every time I have used it I have just found it to complicated to do the simply tasks. I can’t decide whether that it is just because it is new and something different or that it really does need a rethink for simpler use cases. I think it is more the latter and certainly needs a lot of work in terms of accessibility etc. The last presentation I watched about this thing was the one by Morten Rand-Hendriksen at WordCamp US 2017 and I found it deeply ridiculous. WTF has VR to do with this and why nobody dared to point out that WYSIWYG simply doesn’t exist anymore in web publishing – simply because there is no standard screen size. As for the competition they are talking about is clearly the one for wordpress.com and the average USER of the self hosted package simply never gives a s//t about Wix or whatever they call the competition. Give us a break please. Hey there! You asked what it means for an everyday blogger if a power user can’t like Gutenberg, so I’d like to share my perspective. I am not a developer, and I use WordPress to power my personal blog. I don’t do overly complicated things on my blog, and I post maybe 1-2 times a week. I switched to the Gutenberg editor two weeks ago and have used it for two posts so far- and I love it. As someone who doesn’t work with shortcodes and doesn’t know development, Gutenberg unlocks a world that I’ve wanted in WordPress but never had access to before. I found it to be super intuitive and easy to use. Every time I watch a video about what it can do, I am amazed, and when I write in it, I feel powerful. I enjoy writing and sharing short stories, and I have a feeling the blocks will give me the option to format my stories in a way that will really draw the reader in and make it more entertaining- both for me and my readers. And as someone without the tech background- having it all easy and intuitive, right there, is awesome for me. I think that it may be easier to win over a “normal user” as opposed to a “power user” because we have fewer habits that we will have to change. For a normal user, Gutenberg expands our options. For a power user, Gutenberg interrupts the complex flows you have established. This is really interesting and good to hear. I’m definitely not saying that it’s a bad thing. Gutenberg is a nice piece of software (I’m hoping my previous user experience was just uncovering issues that will be fixed before launch), and will be a huge improvement for many bloggers and site editors. Thanks for posting your own experience here. This stuff is invaluable.